Maintain your pooch or kitties’ pearly whites this month at The Frank Samways Veterinary Clinic in North Melbourne. All throughout August, the clinic is offering free dental health checks to promote healthy teeth and gums for Pet Dental Health Month. As with humans, maintaining good oral health in pets is not just about looks. In fact, studies have demonstrated an association between oral health and health issues concerning kidney, heart and metabolic systems in cats and dogs. Neglected teeth can also lead to accumulated bacteria laden plaque above the gumline, causing long term oral health issues. Signs of oral disease or gastrointestinal system include bad breath, excessive drooling, inflamed gums, tumours in the gums, cysts under the tongue and loose teeth. There is however, a range of ways to care for your cat or dog’s oral health. Giving your feline friend raw chicken bones – like chicken wings – to chew on is a great way to clean and floss their teeth. For dogs, treats, toys specifically designed to care for teeth and of course raw bones will all help in maintaining tip top teeth and glorious gums. Both cats and dogs will benefit from dry food tailored to cleaning teeth and maintaining good gum health. Another method – although not suitable for all cats and dogs – is regularly brushing their teeth with a specialised tooth brush or finger toothbrush. • Familiarise your pet with the idea of getting their teeth brushed by massaging their lips with your finger in circular motions for up to 60 seconds once or twice a day. Then proceed to do the same with your pet’s teeth or gums. • Once your pooch is accustomed to the sensation of brushing, put some pet-formulated toothpaste on their lips to get her used to the taste. • Now it’s time to introduce your cat or dog to the pet toothbrush! Simply apply toothpaste to the brush and brush their teeth in the motion stated above. It is however, recommended you speak with your vet about the specific methods that is best suited to your pet and their age. A veterinary examination prior to brushing your pet’s teeth will also help you to gauge whether your cat or dog has existing oral health issues that may make the brushing experience uncomfortable. For example, your dog or cat may have mild gingivitis and brushing too hard can hurt his or her gums. 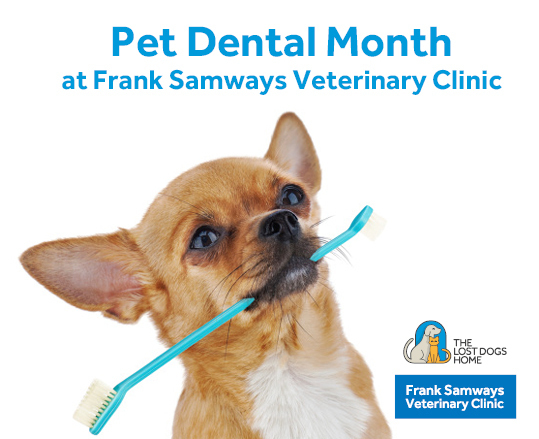 To learn more about your pet’s dental health, make an appointment for a free dental health check at The Frank Samways Veterinary Clinic today! The examination includes an inspection of your pet’s teeth and gums for signs of plaque or gum disease, advice and a quote if necessary. Finally, clients can look forward to a $10 discount with every bag of Advance Dental Food purchased following the free dental health check. To make an appointment for a free dental health check, simply call The Frank Samways Vet Clinic on (03) 9329 2755 or visit 1 Boundary Road, North Melbourne. The Frank Samways Veterinary Clinic is state-of-the-art, purpose built veterinary clinic offers modern diagnostic and surgical facilities, together with a wide range of veterinary services, including dentistry. Our staff are passionate about animal welfare and work to provide the best care tailored to your pet’s individual needs. All proceeds of the vet clinic are directed to The Lost Dogs’ Home shelter as we continue our commitment of fighting for a better deal for all dogs and cats.